Funny thing about being an author - particularly one who's grown all too accustomed to working in digital channels. You spend months toiling over a book. Submit it, edit it, correct it, and then...you wait. Then, one night you come home from a dinner party and find UPS left a carton in the lobby with your name on it. 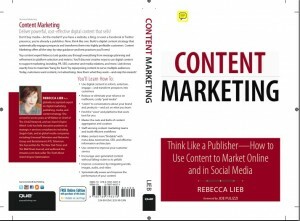 And so my second book is manifest: Content Marketing: Think Like a Publisher - How to Use Content to Market Online and in Social Media. It's exciting to finally hold a copy in my hands, but I'm more excited to see how it's received by marketers of all stripes. Technology has gotten marketing to the point at which it's no longer necessary to buy media to disseminate messages. It can be equally - if not more - effective to create your own media. Doing so, however, requires entirely new sets of skill sets and mind sets that are unfamiliar to marketers and advertisers. Instead of thinking about campaigns, they must think continuity. Instead of broadcasting, the emphasis now is on conversation and dialogue. Instead of interruption, the goal is tune-in. I'm interested in how marketers will use this book (and eager to hear reactions in the comments). And I'm far from done with the topic. I'm excited to be able to follow up on the book with a research project I'm just embarking on, in which I'll delve into the changing organizational and resource needs of brands, agencies, vendors and media companies as a result of content marketing becoming a permanent and pervasive reality in marketing today. I hope you'll consider reading my latest book. Please let me know what you think if you read it.